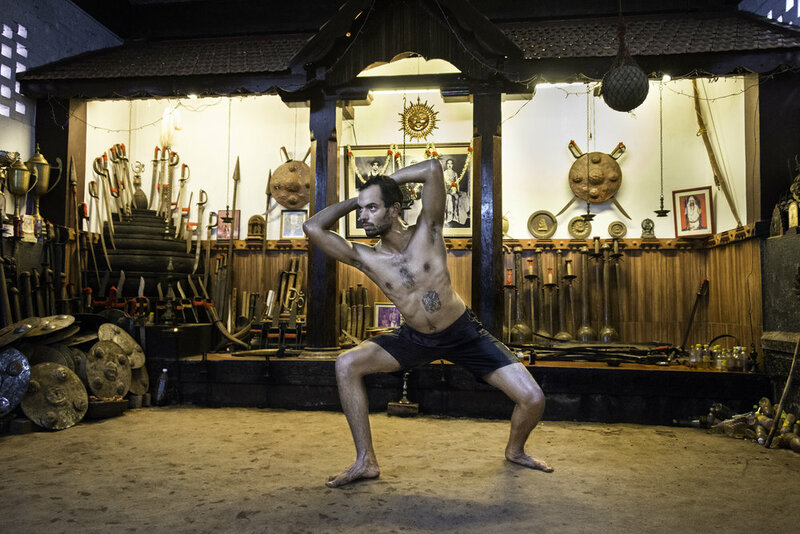 The space is essential to the art form, the very name contains it: kalaripayat means the technique practiced in the kalari. As soon as you wake up, it calls. You step down through a low door facing east, to meet the earth. You enter and it tells you what to do, like the cup tells you how to hold it and drink. The library, the theater, the temple, the classroom demand a hush, as you prepare yourself for what comes next. But in them you move through spaces already full, of books, of seats, of desks. The kalari is empty in the center; there is nowhere to sit. Like the dance studio, the fencing piste, the squash court, the surface must balance support and forgiveness. Here, it is the mud, ready to receive and absorb your kicks, your leaps, your sweat. Its emptiness allows you to empty yourself into it. No paint, no easels, no clay, no potter’s wheel. Nothing will be produced here that can be reproduced or sold. You are the artist and the material you work. No telephone, no computer – no digital here, it’s all analog, muscles and bones aligned in real time. No coffee machine, no water fountain. You are your only resource, your only recourse. Weapons line the periphery, from a time when opponents looked each other in the eye. Long sticks, short sticks, the otta, double-curved like a spine, the mace, daggers, swords, spears and battered shields. Each one is like a book you read that changes you; you learn a way of holding, a way of moving, a way of countering and directing force that gets into your blood. These are real weapons – if you get hit, it’s going to hurt. It seems obvious that the pain is wherever the blow landed – knuckles, ankles, thigh. Sure, that’s where the damage is, but the pain is elsewhere. Pain is in you, it is telling you where you are, your boundaries. You learn your limits as you push them. You leave the kalari the same way you came in, taking leave of the gods, stepping up into the world. The whole day awaits. Gitanjali Kolanad has been involved in the practice, performance, and teaching of bharatanatyam and kalaripayat for more than thirty years. Her short story collection, 'Sleeping with Movie Stars’ was published in 2011. She is currently working on a novel set in 1920s Tanjore.